José Mourinho says Cristiano Ronaldo earned Sir Alex Ferguson education, from when he was in Manchester United. Journalist: Did Cristiano Ronaldo confirm what you were expecting from him? Mourinho: He excelled my expectations. I coach the player Cristiano Ronaldo and not the man. Here, what matters is the player, but i prefer to start talking about the boy, the youngster, the man, whatever we may call him. Not concerning the professional side, he's a fantastic kid, a wonderfull boy. And that applies to him as a man. It's a pleasure to meet him and be with him every day. It's a shame that only a few people have that privilege of truly knowing him, because he has to block a reasonable part of what is his world, since he has such a huge personal and professional dimension all over the world. But I don't get tired of repeating it, he's a wonderfull boy. Then, as a player, he's everything you already know and a bit more. His quality as a professional, his ambition... i don't even have the words to qualify him. Journalist: A while ago, you said Cristiano Ronaldo wasn't getting protected in the spanish league. Could that mean some referees already tend to judge tackles on Ronaldo differently from what it is supposed? 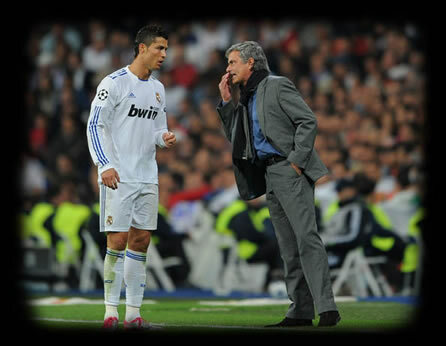 Mourinho: I think Cristiano Ronaldo as a player is a bit like me as a coach. He's not like a politician trying to sell his image, he's just what he is, without worrying about the need to fake he's something else in order to get seen differently and have a more positive image to the public. Then, as a player, Cristiano Ronaldo is everything everyone would want to be. He's the best, one of the bests, he earns more money than anyone else, both in football as in publicity/advertising. He has the girlfriends others wish to have, he has a fantastic family around him, who make him feel like a boy. He's everything that others want to be. Journalist: Do the other players also treat Cristiano Ronaldo differently? Mourinho: I'll tell you a little story regarding that, which took place in the end of a league match this season. In the end of that match, i saw a player from the opposite team, standing in front of our locker room. I then asked him if he wanted something and he answered that he wanted to switch shirts with Cristiano Ronaldo. I told him to enter, but he prefered to stay near the door. In the next day, I read in the newspapers that the same player said that Cristiano Ronaldo is a teaser, who loves to dive, who doesn't respect the opponents and the public. That's the kind of stuff that Cristiano needs to live with, but happily, he already learnt how to deal with those situations and he keeps on with his life. But we have to admit, that's an ungrateful situation. Because he's the kind of player who brings "magic" into every week's game, has a coach who doesn't protect him, since i put him playing in all matches and don't rest him when the team doesn't need him... Thank god he earned Sir Alex Ferguson noble education. Journalist: Do you see that as an advantage? Mourinho: Sometimes, having that kind of education is costly among certain football cultures. He's the kind of player who likes to make prevail his physical strenght, handle hard tackles and stand on his feet, showing he's stronger than others. It seems that this type of attitude punishes him even more, because some referees like to be helped, and by help I mean, diving, faking injuries, asking for cards, etc. Having earned the british education from Alex Ferguson, Cristiano Ronalod is the opposite of that. And if put that all together, the result we have is a player who isn't loved by the public. He just keeps following his onw path, and that's the wisest thing he can do. Journalist: Do you feel this Real Madrid is very dependent on Cristiano Ronaldo? Mourinho: I think all teams depend on key players. Chelsea depended on Frank Lampard who scored around 40 goals per season, and Drogba who had 30 goals every season. Same as Benfica who also depended on Eusébio, back in the days... Every team always depend a bit more on their most important players. Now, in order to protect such kind of players, like Cristiano Ronaldo, who we have to build a team where he feels like a "fish in the water". He has to be 100% happy in the pitch, not only with his attacking tasks, but also with his deffending ones. Then, if he's happy, he'll be able to give much more to the team and the proof is that this season he's breaking all his goals records. From the physical point of view, he'll need to be lucky not to get those traumatic injuries, which we can't prevent. But he is physically stronger than ever and I believe this year he'll achieve his best season ever. Journalist: Earlier, you said you didn't protect him. Do you think he is the kind of player who performs better if he plays in every game? Mourinho: First, he always like to play and the mental side is the most important. We played at home against Murcia and he was sitting on the bench, which made him very unhappy. I think this is psychologic, it's the pleasure of playing. Against Murcia, even though we're talking about a team who competes in the 3rd division in Spain, the stadium was over crowded. It was like Cristiano Ronaldo felt the obligation to step up and give people what they were waiting for. That was a day where the tickets were cheaper than usual, and the type of public in the stadium was different. We could see a lot more young people, which don't have the same money that regular attending fans have. Cristiano was feeling the need to play in that match and do things well. He loves to play, he feels well and stronger with it. Then, the match ends and everyone can say that it wasn't necessary that the coach had to put Cristiano Ronaldo playing and that he should have rested in this game. But that's not necessary and if he doesn't get any serious injury, I think he should play everytime.